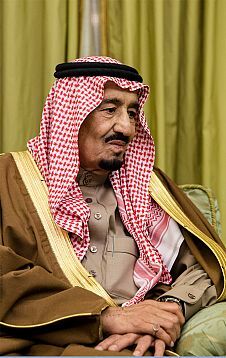 HM King Salman bin Abdul-Aziz Al-Saud was proclaimed the seventh king of the Kingdom of Saudi Arabia in January 2015, after the passing of King Abdullah bin Abdul-Aziz. He had previously held the position of Crown Prince since June 2012. King Salman’s influence comes from being the absolute monarch of the most powerful Arab nation and is manifested by the role Saudi Arabia plays in three critical areas: 1. having the two holy cities of Makkah and Madina, which millions of Muslims visit throughout the year; 2. exporting crude oil and refined petroleum products, which ensures its central international role, and 3. propagating Islam through its huge da’wa network, which makes its influence felt in all Muslim countries. On June 21st, 2017, King Salman appointed his son, Mohammed bin Salman bin Abdul-Aziz as Crown Prince of the Kingdom. Custodian of the Two Holy Mosques: HM King Salman has significant influence in the global Muslim community through his custodianship of the two holy cities of Makkah and Madina. Makkah is the main pilgrimage site for 1.7 billion Muslims. Each year approximately 4 million pilgrims perform the Hajj. In addition to this, approximately 10 million pilgrims (including Saudi residents and GCC citizens) perform the umrah, ‘the lesser Hajj’, throughout the year. A multi-billion dollar expansion to the two mosques is well under way. Controller of the World’s Largest Oil Reserves: HM King Salman reigns over a land of massive crude oil reserves—Saudi Arabia has approximately 20 percent of the world’s proven oil reserves—making him a key player in the global petroleum industry. Head of the World’s Largest Da’wa Network: King Salman is also head of the most extensive da’wa network of missionary Muslims in the world, promoting the Salafi brand of Islam. Salafism is historically rooted in Saudi Arabia, and owes its global spread to the financial backing of Saudi Arabia. Its violent off shoots have meant that Saudi Arabia itself is a target for them and in an effort to combat this extremist ideology, King Salman launched the Global Center for Combating Extremist Ideology (GCCEI) in an inauguration ceremony attended by US President Donald Trump during his first trip to the Middle East. Successful Governor: King Salman was governor of Riyadh Province from 1955-60 and from 1963-2011. During that period, he oversaw the development of the capital city Riyadh from a small town into a thriving city of more than 7 million people. He played a major role in attracting capital projects and foreign investment into his country and improved political and economic relationships with the West. He built up a strong reputation for having an efficient and corruption-free administration. Military Action: In March 2015, King Salman launched a nine-state coalition bombing campaign against Houthi rebels in Yemen. The campaign is seen by many as curbing Iranian influence in the region. Saudi Arabia is also supporting many of the anti-Assad factions in Syria. Key Appointments: King Salman has made important decisions regarding appointments in key positions. The most important of these was the appointment of HRH Prince Muhammad bin Naif as Crown Prince. This marked the first time that a grandson of King Abdul-Aziz, rather than a son, held the position. The transfer of power to the new generation, which some feared would be an issue that would split the country, was remarkably smooth. Since then, King Salman has promoted one of his sons, HRH Prince Muhammad bin Salman, to Crown Prince. Another key appointment was of Adel Al-Jubeir, someone who is not a member of the Saudi royal family, as Foreign Minister. Historical Decisions: Since the appointment of his son as Crown Prince, several major historical decisions have been made including allowing women in Saudi Arabia to drive, opening cinemas and . The decision to float Saudi Aramco however, was one that King Salman did not approve of. Influence: King with authority over 26 million residents of Saudi Arabia and approximately 14 million pilgrims annually. Historical Decision: On Tuesday 26th September 2017, King Salman issued a historic royal decree allowing women in Saudi Arabia to hold driving licenses by June 2018 thereby ending Saudi Arabia’s position as the only country in the world not to allow women to drive. The economic, social and religious effects of this momentous decision will be closely watched in the year to come. $15 million – pledged for Rohingya Muslim refugees in Bangladesh. 2.4 million – pilgrims visited the kingdom in 2018.